An excellent visual aid for learning to stretch. 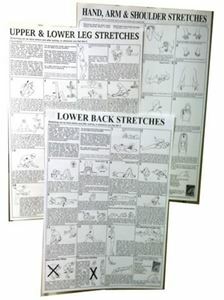 These easy to read stretching charts can be displayed in your home or workout area to serve as a reminder to stretch! Bob has developed stretching routines to do before and after many sports and activities, as well as for specific body parts, different physical conditions and age groups. For more titles, see Laminated 22 1/2" x 34" Stretching Charts. Chart titles are available in either 17" x 22" OR 22 1/2" x 34", not both. See drop down list on each webpage for titles available in that size. Laminated posters cannot be shipped USPS Priority Flat Rate Envelope for $7.35; please choose only UPS or USPS Priority package shipping options (or USPS First Class Mail if weight is under 13 oz. = one 17" x 22" poster). All stretching charts are also available in laminated versions, paper, folded versions, paper, flat, individual 8 1/2" x 11" laminated pad sheets, and in 8 1/2" x 11" pads for handouts. The posters make an excellent teaching aid and are an added professional reference touch in any workout or treatment facility.